It was a fun weekend. Nothing extraordinary, just good. On Saturday, I decided to go to the Farmers Market. It's been ages since I went, so called Susan and we met there. The produce looked wonderful, lots of squash and late summer veges. 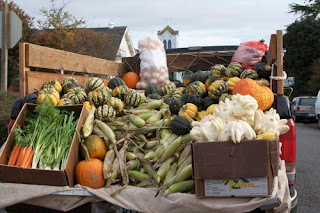 The market has been extended to mid-December, but it really isn't a lot of fun to go when it is cold, windy and raining! And it must be hell for the vendors, too. But Saturday was a pretty day, not too cold and no wind. Then we went to the little hole-in-the-wall coffee shop and sat and watched people. I don't know why, but people in Port Townsend try to outdo themselves, looking and dressing weird! Some are just bizarre and I wonder what on earth they are thinking! Very individual!!! Yesterday, the weather had turned nasty again (I saw the barometer dropping on my newly-installed weather system!) but Susan and I had planned a jaunt into Silverdale to the huge new thrift shop. The drive there was beautiful, trees of every autumn hue along the highway and in the town, giving it some personality. Silverdale is such a blah place, so the trees really perked it up. It is built around a mall - in fact Susan says it's just one big strip mall! You can find just about everything you need, but it really isn't a destination other than to get necessities. After finding some treasures at the store, we had a really nice lunch at Red Robin - enormous hamburgers - and mine is still with me this morning. It is absolutely pouring today so no walks. But I did start yoga-pilates. I have a dvd so started this morning. Pilates is deceptively gentle and I know will be stiff tomorrow! But not getting out to walk is not good, so figured I better figure out something else to do. The site is coming along well, the logo is almost there and the business side of things is supposed to be set up by the end of the week, so then I can order supplies like bags, labels etc. Today I will finish up the garage and have it ready to paint. Something I have been putting off but need to do soon so the paint can off gas before I have to be in there a lot.